Trying to build a control deck in competitive EDH is a challenge. Trying to do so while everyone else is storming and comboing off is even more difficult. This usually requires removing multiple combo pieces and countering several spells. Which creates a difficult job for the Fun Police. However we may have a way to do this. To assist with this, I have written the following primer on the theory and construction of a Tasigur Control deck for Competitive EDH. Introduction - Who am I? Why do you care? What is this all about? Welcome to the Fun Police of Competitive EDH. We are not the bureaucratic rules creators, hammering the drum of stax all day long. We are not the combo decks, flying down the highway at breakneck speeds. We are patient and reactive, we see problems and answer them. We have a few things we use to set the standards but mostly we wait and make sure that people stay within the bounds of a fun, functional and civilized game of Magic. This is a special calling, not everyone’s cup of tea. We get prepped for a game knowing that it is going to be a challenge to keep everyone in line but we are ready for the long haul. Now that you have the idea of what we are piloting, let me introduce myself. I am Cameron from the Laboratory Maniacs. I’ve been an avid EDH/Commander player since 2008. I’ve been playing attrition style control and value engine based decks for the majority of that time. I have been playing Competitive EDH for notably less due to not enjoying the playstyle of either storm or stax decks. I was able to convert my favored deck style into Competitive EDH and have been fine tuning it ever since. As some people have noted, ‘It doesn’t follow cEDH rules!’ and they are correct. I will be walking you through why and how this is the case through the rest of this primer. Commander Selection - Why Tasigur? From the start everyone asks why Tasigur, the Golden Fang ? What does he do that no other general does? Why can this not be Thrasios, Triton Hero + a partner? I will be addressing these questions one at a time. Why Tasigur? Well, first off, he’s cheap. Delve with fetchlands means that we often only tap 1 land to cast Tasigur. Second, He has great creature stats. A 4/5 creature is a great blocker and an efficient beater. It is six turns of combat damage before we can general damage someone out but it is also a reasonable creature to pressure life totals of people playing Ad Nauseam and Doomsday . What does Tasigur do that no other general can? Primarily, he gives you infinite recursion. By this I mean that his ability lets you reuse spells without restriction. Beyond being able to cast the same spell multiple times in the same game, his activated ability lets you play politics with the entire table. Your opponents are not always against you and he enables your ability to play them off of each other. None of your opponents want to lose. If you have an answer when no one else does, you can activate Tasigur and another player that stands to lose the game will likely give you the answer to address the current catastrophe. Why can this not be Thrasios? This is very relevant to Tasigur specifically. There used to be a diverse set of decks specifically aimed and getting infinite mana for Tasigur and comboing out for a win. However, as part of the Commander 2016 product, Thrasios was printed and for comboing off into a win, he’s just better. Thrasios does not require colored mana to combo off. This opens up so many more infinite mana combos and due to his partner nature, it opens up other colors as well, notably white and its several artifact and enchantment tutors. This makes comboing off with Thrasios easier and Tasigur fell out of favor from there. However comboing off is not what this deck wants to do. Tasigur gets us cards from the graveyard, which Thrasios does not. Thrasios does provide card advantage but he has an end to what he can do. Once the cards are gone from your library Thrasios can do no more. Tasigur can still continue to get you cards back. This allows us to reuse the same answer again and again. Some notes about this Deck Tech video. The card choices in this deck have changed notably since the time of this recording. Updates have been documented and newer strategies are in use. You can still use this for deck philosophy and decision making information but some information in this video is now woefully out of date. Decks evolve and this one has grown a lot in the last year. Tasigur Seasons Past / Season Pastigur - My current list, a budgetless control deck. Tasigur Control on a Budget - A deck inspired by my list. This was built on a $750 budget by buildingadeck. When he started creating this list he asked me for input. We worked through to prioritize specific higher value cards and find lower priced alternatives for many of the more expensive cards out there. Tidespout Tasigur - Alternative take on control Tasigur by AdmiralFisticuffs. This deck uses Tidespout Tyrant and mana rocks as a combo engine to generate infinite mana. Tasaketh - Tasigur deck based on Razaketh the Foulblooded by cEDH_Stu. Aimed at using Eldritch Evolution as the combo enabler to bring Razaketh into play. Then using Razaketh lines with Life/Death in order to assemble Isochron Scepter and Dramatic Reversal. Ad Nauseam Scepter Combo - Alternative take on Tasigur by ShaperSavant. Aimed at comboing out quickly through Ad Nauseam. This deck forgoes several elements of control for a lower mana curve and aims to draw as many cards as possible from Ad Nauseam in order combo off with Dramatic Reversal immediately after resolving Ad Nauseam. Ad Nauseam Land Combo - Another Ad Nauseam approach to Tasigur. This is aimed at a higher land counter using more utility lands and making for a more reliable Ad Nauseam. Less life lost means more cards drawn and a greater chance of getting the cards you need for the deck. This also uses the higher land count to force fewer choices for your opponents when you activate Tasigur. There is no perfect list. Control decks are ones that require tuning to a meta. The large variety of decks that are available to play against leads to certain play groups requiring more of one aspect or another. This leads into our next tenant. Every play group is different. You need to know yours. Whether it is budget, play style, meta, or just people. Some groups will be slow and grinding. Others, all combo all the time. You need to know your group to properly create a control deck that can function in your play group. As such, my deck isn't the end all be all list. It is tuned to play in a broad environment that is the top end of tune cEDH decks. Some things in it won't make sense for your meta. Tasigur decks are based on a collection of packages that are aimed to work well together. Below I've listed several packages that you will want to consider when putting together your deck. Some of these have major deck building considerations and you will need to make sure that these considerations into account, i.e. please don't put Ad Nauseam and Reanimator together. Most of these packages are aimed at the value and combo aspect of the deck and will not cover the entirety of the deck creation. Land Base in particular is going to vary depending on budget, card balance and meta. Additionally the balance of Stack Interaction, Spot Removal and Mass Removal will need to be adjusted based on your budget and meta. Life from the Loam is one of the single best cards for Tasigur. I cannot hail its praises enough. It fuels Tasigur's delve and provides more options for Tasigur activations. It secures land drops every turn, fills the graveyard for Tasigur Delves and it acts as our cantrip engine. There is a discussion to have regarding cantrips in Tasigur. Sorcery speed cantrips ( Preordain , Ponder , etc) are a mainstay of almost every Competitive EDH deck. You use them, gain some card selection and then move on, possibly only touching them again if there is a Timetwister or Yawgmoth's Will that resolve. In Tasigur, unless these are cast early and Delved away by Tasigur, these spells stick with you. They go to your graveyard and then they are the least innocuous thing that your opponents can give to you. Not ramp, not tutors, not counterspells, these guys. They are sorcery speed and they take up one of our most valuable resources, blue mana. When we activate Tasigur for value at the end of the turn, you'll likely get one of these back, they don't show real threat, just resource investment. Instead of being a one shot, one mana, cantrip we either keep this card in hand or continually spend 5 mana to get value instead of the 4 that we normally want to spend with Tasigur. This is where Life from the Loam steps in and covers another base for us. We can include cycling lands ( Barren Moor , Tranquil Thicket , and Lonely Sandbar ) in the deck. This allows us to have cantrips in our graveyard that cannot be returned to our hand by our opponents with Tasigur. We can then juggle Life from the Loam and the cycling lands to fill our graveyard, draw cards, get actual value cards with Tasigur, and hit our land drops. Adding in additional tech land cards like Strip Mine or Glacial Chasm allows us to round out a proper package for Life from the Loam as an allstar value engine for a Control Tasigur deck. When looking at a win condition for the deck, combining Tasigur with infinite mana allows us to put all nonland cards from our deck into our graveyard and then into our hands. This also means that any card we have cast or cast again we can return to our hand. For more information regarding which cards are best used to loop and win the game, see the Win Conditions section below. Generating infinite mana is not as simple for Tasigur as it can be for other popular commanders, like Thrasios. As Tasigur requires blue or green mana this adds an additional layer of complexity for our infinite mana options and, as such, we have fewer routes to take towards generating infinite colored mana. Here are the most common routes to infinite colored mana to consider for Tasigur. Each applies specific deck constraints and all have their own advantages and disadvantages. This requires a sufficient number of non-land mana sources. Mana rocks are the prefered route as they are more resilient than creatures. This requires a high density of non-land mana sources in the deck and you need to include multiple that tap for colored mana. This route is easier in Thrasios decks as he does not require blue or green mana and colored mana sources have either higher costs or additional constraints you have to deal with. The most compact of infinite mana outlets. This guy can go infinite with itself and lots of lands, specifically a Cabal Coffers tapping for at least eight black mana, five lands that can tap for blue and at least one green land. This is a pretty honorous set of requirements for Competitive EDH, but is possible. Palinchron can be paired with a number of other cards to make this route easier. Phantasmal Image makes for the most compact additional card to speed up the infinite mana combo. If you happen to be running reanimator then Show and Tell may be an option for you. Adding Omniscience to your Show and Tell package can add an additional infinite mana pair for Palinchron . This is a similar route as Dramatic Reversal + Isochron Scepter and can be played along side it. This route primarily involves a method of cheating Tidespout into play, mana rocks that tap for more mana than they cost and additional mana rocks that tap for colored mana. The primary methods of cheating Tidespout into play are reanimation, Eldritch Evolution , and Oath of Druids . Eldritch Evolution can be cast directly on Tasigur to fetch out Tidespout. Oath requires a bit more of a commitment. To run Oath consistently you will need to remove all other creatures from your deck. This will reduce some of the utility and mana acceleration we get in creatures and will replace it with more mana rocks and other forms of interaction. To generate infinite mana you are using a pair of mana positive mana rocks ( Sol Ring , Mana Vault , Mana Crypt , or Grim Monolith ) and a colored mana rock to filter colorless mana into colored mana. Target Mana Crypt with Tidespout Tyrant's on cast trigger. Return Mana Crypt to your hand. Tap Sol Ring for mana. Target Sol Ring with Tidespout Tyrant's on cast trigger. Return Sol Ring to your hand. Tap Mana Crypt for mana. Once you have generated infinite colorless mana you can substitute in a mana rock that produces colored mana like Simic Signet , Dimir Signet , or Fellwar Stone into the loop to generate infinite colored mana. Though it can be paired with Palinchron to generate infinite mana, Deadeye on its own is not the most spectacular of cards. This route is usually chosen as a method of infinite mana generation when dealing with a budgetary concern. You can pair Deadeye with Great Whale or Peregrine Drake and generate infinite mana on a much lower budget (~$3) than Palinchron (~$20). For the Untap route you are looking at Umbral Mantle and a creature that taps for four or more mana. Creatures such as Priest of Titania , and Elvish Archdruid fill this role. You are able to tap the creature for mana, untap it and generate an infinite amount of green mana this way. You can then use Tasigur to find additional ways to filter that mana into other colors or generate a sufficient amount of mana that you can then shift the mantle to another creature and generate the mana of your choice while untapping it with the excess of green mana. For the Bounce + Haste route you are looking at Temur Sabertooth and Cloudstone Curio as your bounce enablers and Lightning Greaves or Concordant Crossroads as your haste enabler. You then repeat casting a creature, tapping it for mana and bouncing another. Alternate creatures, both tapping for mana and gaining positive mana with each cycle. For Cloudstone Curio , your creatures usually end up with Priest of Titania , Elvish Archdruid or Bloom Tender . For Temur Sabertooth your creatures are Priest of Titania and Elvish Archdruid . Enchanting a Bloom Tender with Freed from the Real allows the Bloom Tender to tap for Blue and Green, then untap the Bloom Tender for Blue. This nets you a Green mana. Having a black permanent in play adds a Black Mana to that equation. Either way, you get infinite Green mana and can then go infinite with Tasigur. If you have no way of generating other colored mana, you can cast an artifact rock to generate that mana, tap it for the mana, then destroy it with Beast Within or Nature's Claim and then get both items back with Tasigur, rinse and repeat for as much additional colored mana as needed. In place of Bloom Tender, you can use an Arbor Elf enchanted with Freed from the Real. If you target a Forest that is enchanted with a Utopia Sprawl (that named blue when it entered play), then you can generate infinite Green mana in the same way. If you have enchanted a Tropical Island or Breeding Pool with the Utopia Sprawl (naming blue) then you are able to generate infinite blue and green mana. The big benefit of this route is that the only card that is a dead draw on its own is Freed from the Real. All of the other pieces are mana accelerators and are great to deploy early. The big downside is that the creatures are required to stick around for a turn and they are subject to the same Stax effects that Tasigur is subject to. Its pretty self explanatory. Have several mana rocks and mana dorks. use these to cast spells, untap them, keep going. Having lots of non-land mana sources makes this more powerful and allows you to dig more with Tasigur for useful spells to keep chaining. Once you have an Isochron Scepter and any instant that you can imprint on the scepter you can cast spells infinitely and generate infinite mana. This then lets you Tasigur out your deck and win through any normal Tasigur route. Using Eldritch Evolution on Tasigur allows for an efficient deployment of multiple high cmc creatures. Typically you will want to include two evolution options with one being either Tidespout Tyrant or Razaketh. From that decision you tailor your deck to support either Tidespout or Razaketh and if you are not in a position to go off with that card, you can EE into a card advantage engine. Nezahal has almost entirely surplanted Consecrated Sphinx as the marquee card advantage engine. Nezahal draws in line with Mystic Remora and has the ability to protect itself. Pairing Nezahal with Life from the Loam allows you to hold multiple lands in hand to discard and protect Nezahal if it is targeted for removal. As in the section above, you are using multiple mana positive rocks to bounce each other, generating infinite mana, then using a non-mana postive rock to filter the colorless mana into usable colored mana for Tasigur activations. Razaketh is an incredibly powerful tutor engine. As such there is a lot to consider when including it in a deck. The Razaketh section below goes over the specifics of the engine. In general, you use Razaketh to assemble the Dramatic Scepter combo and then use another win condition with Tasigur to end the game. With multiple methods to cheat Razaketh into play, either Reanimation or Eldritch Evolution, we can use him as an engine to push for an immediate win. Once we have cheated Razaketh, the Foulblooded into play, we are just getting started. The big question is where do we go from from here. The most important thing in winning with Razaketh is to plan in advance: How many resouces do I have? What possibilities for disruption are on the board? What mana do my opponents have at their disposal and what might be in their hands? Razaketh himself needs two resources: Life and creatures. The cards we usually aim at to go off are Isochron Scepter , Dramatic Reversal , and three available Mana in non land mana sources; two of them are required to reactivate Isochron Scepter and one to go infinite. If the only colored mana you can produce with these mana rocks black, generate a substantial amount of mana, then use it to recast Tasigur, then sac him to Razaketh and grab another mana rock that produces blue or green mana for the Tasigur loops. This usually comes down to four cards we get from our deck: Isochron Scepter , Dramatic Reversal , Mana Crypt and a coloured mana rock such as Mox Opal / Mox Diamond . Often times we already have some of these in play and can assemble this around what we already have in play. The full process listed above would usually require us to sacrifice four creatures to Razaketh and pay eight life. While the life cost is often negligible, it is rare to have four creatures out. Luckily, we can solve this problem with card:Life//Death. This card can turn all our lands into Razaketh fodder and solve the creature problem with ease (usually leaving some lands behind in case we need protection or removal). We start with the first bit. Cheat Razaketh, the Foulblooded into play, sac a creature (Keep in mind: Our commander can be delved in easily in case we have no other creature to sac), grab card:Life//Death from our library, cast Life, tap then sacrifice four lands to get the winning pieces listed above. This win comes at the cost of one green mana and ten life once Razaketh is on the battlefield. In case you need coloured mana from Mox Diamond you need to plan in another land and two life to grab another land to hand. A part of the Dramatic Scepter combo is in exile? In this case you do not go for a Razaketh without having access to Riftsweeper . If there are multiple pieces of the combo in exile, you can bounce Riftsweeper and recast him to get the remaining missing pieces. You can also reconsider grabbing your alternative Evolution target in this situation. A card you need to loop is in exile? Don't despair, the elegant part of most of these loops is that they have built in back ups. While you usually loop Beast Within and Reality Shift , you can also exile their libraries with Praetor's Grasp , though this is at sorcery speed only. If you also happen to run Aetherflux Reservoir , you can use it as your wincondition instead. Put it into play then build up life total through Isochron Scepter activataions and casting Dramatic Reversal to your hearts content. This is a tricky situation. Usually at this stage of the game you are under significant pressure and are needing resources to either stabalize or have already stabalized and are at a very low life total. At this stage you have two primary options for your Eldritch Evolution. Evolve Tasigur into card:Nezahl, the primal Tide instead of Razaketh. This will work to provide you a steady source of card advantage and can fuel the rest of the game. From here you start working on a combat damage win or start assembling the combo pieces without Razaketh. Evolve Tasigur into Razaketh and grab an Aetherflux Reservoir . You are then looking at using your storm and the Reservoir to gain you enough life to continue the Razaketh line. This is a more resource intensive line and leaves less mana available to you for protection. Take a look at the boardstate and decide which route you prefer. If you have judged the moment correctly, the second option can be just as potent as a normal Razaketh line. The Stax and Interaction to look out for. Luckily both Tasigur and Razaketh have the same vulerabilities - Cursed Totem / Linvala, Keeper of Silence . However Razaketh has one additional vulnerability (though it is so rare it is almost irrelevant) Angel of Jubilation . For almost any other Stax piece you can use Razaketh to search your deck for a way to nullify the card and move on with your win. The last word of caution to look out for is Trickbind . It locks you out of activating what ever permanent is countered for a whole turn. The upside to this is that regardless of where you are in the process, Trickbind would stop you. Trickbind on Razaketh, on Isochron Scepter, or on Tasigur would stop you for the whole turn. Your opponent will choose the most opportune moment for them, usually the most exposed moment for you. If your opponents are familiar with the deck it will be at one of a few different points in the chain. Your first sacrifice to Razaketh. Your first sacrifice after casting Life / Death . The imprint trigger on Isochron Scepter. The First activation of Isochron Scepter. The First actication of Tasigur after generating unbounded mana. If you fear Trickbind, there are a few things you can do to protect yourself yourself. First is to prepare by having additional creatures in play before tutoring with Razaketh for the first time. You do have the ability to bolster yourself with Razaketh activations. If you hold priority and sacrifice multiple creatures all in a row, your opponents cannot respond until you have passed priority. They can still Trickbind Razaketh at this point, countering a single activation and preventing you from activating it again for the rest of the turn, but you will still have multiple other Razaketh activations on the stack. At this point your opponents may not Trickbind Razaketh and move on to trickbind the Isochron Scepter Imprint trigger, you can work around this with a Copy Artifact in your library, an additional sacrifice and some more mana can give you a second Scepter, this one has not been trickbound and can be imprinted with Dramatic Reversal. If they counter the first spell activation from Isochron Scepter, you are in a rough spot. You have already exiled Dramatic Reversal. There are lines to get your Dramatic Reversal back but they are most likely too expensive for you at this point. You are looking at working to protect your Scepter until your next chance to untap it. You are pretty out on a limb here. Good luck. If they have waited to the point of you activating Tasigur for the first time to Trickbind Tasigur, simply sacrifice him to Razaketh, recast him and keep going. This is a large package and is an instant win combo package. Flash Hulk into Phyrexian Delver/Body Double and Viscera Seer. Delver or Body Double the Hulk, Sacrifice the Hulk with Viscera Seer and get Mikaeus and Walking Ballista. Sacrifice Ballista to Viscera Seer, it gains Undying from Mikaeus, Return it to play with a +1/+1 counter on it. Remove the +1/+1 counter from Ballista to deal a point of damage to an opponent, then repeat until your opponents are all dead. This is a viable package but takes a lot of space with many cards that are not in line with the primary control plan that they deck wants to run. Like Ad Nauseam, this is more of a combo route than a control route to take the deck. With to-hand tutors at different CMCs in your deck you are able to pair Seasons Past with infinite mana to cast your entire deck. One tutor can grab another which can then grab Seasons Past. Seasons Past then grabs any number of cards at different CMCs so you can grab multiple tutors. One tutor gets Seasons Past, the other tutors get what ever you want from your deck. You can then can assemble any combo or any recursive loop to win. For reanimation, rather than reinventing the wheel, I will point towards Dies_to_doom_Blade’s Tasigur Reanimator Primer for a full list of reanimation options and deck considerations. However I will point out a few powerful targets and their big upsides. - Jin-Gitaxias, Core Augur , Nezahal, Primal Tide , and Consecrated Sphinx . Massive amount of card draw. - Void Winnower . Incredibly powerful effect, not to be underestimated. - Kederekt Leviathan + Necromancy . Instant Speed reusable ‘All nonland permanent bounce’ for two colorless mana and one black mana. - Terastodon . Great removal and land screw if needed. - card:Razaketh, the Fouldblooded - An amazing tutor engine, see the Razaketh section for the full combo line. I will note that Reanimation is a higher variance option and has fallen out of favor in a Protean Hulk meta. Players are including more and more graveyard hate and the reliability of the strategy has suffered. This is still a viable strategy in lower powered meta games. This card on its own will warp the entire deck. Your goal when including Ad Nauseam is to gaurantee that you will be able to draw enough cards to combo off immediately. This requires several deck constraints when building it, primarily low CMC cards and specific cards designed to either combo off on turn of casting Ad Nauseam (lots of free/mana positive mana sources) or cards designed to combo off after an 'end of turn' Ad Nauseam. Most Ad Nauseam decks are considered more of a Combo deck than a straight control deck. If you choose to go with a reanimation package, adding in Show and Tell hedges your game plan. It is a way to cheat cards from your hand into play with the assumption that what we cheat into play will be better than what our opponents cheat into play. If you choose to go this route, adding Omniscience to the deck is a reasonable option. It is another piece that can combo with the majority of your win conditions and is an incredibly powerful effect. Again I will link to other sources for Doomsday. The EDH Doomsday Primer covers what you need to know to when dealing with Doomsday... and man is it a an enourmous amount. There are several deck constraints that Doomsday will impose on you that are not optimal for a control deck. Cards like Lion's Eye Diamond , Gush , and Laboratory Maniac are all typical inclusions when dealing with Doomsday but are not on plan for a control deck. This would push your deck more toward a combo oriented build than a straight control deck. We have several different methods to win, luckily most of them work with each other. They function off of a small set of high impact cards and methods to generating infinite mana or free spells. The big benefit of all of these is that they all work together to enable a rapid fire Aetherflux Reservoir killing all opponents or a Beast Within and Reality Shift loop to exile all opponents’ libraries. This is the most common route to victory for combo based Tasigur decks. This plan is based off of being able to cast Beast Within any number of times to destroy all permanents your opponents control. Then casting Reality Shift on the beasts generated from Beast Within until all all of your opponent’s libraries are exiled. The plan starts by generating infinite colored mana specifically blue and green. From that point you activate Tasigur until all nonland cards from your deck have been placed in your hand. Then cast Beast Within targeting a permanent you don’t control, activate Tasigur, get Beast Within back and repeat this until everything you do not control is a beast. You then switch to Reality Shift and start exiling beasts and manifesting cards. You then continue exiling the manifested cards until all permanents you don’t control have been exiled and all cards from your opponents’ libraries have been exiled. If Tasigur activations are not available to you, you can complete this same process with Seasons Past and Dark Petition . This will allow you to return Reality Shift , Beast Within and Dark Petition to your hand. You can then loop Seasons Past with Dark Petition and cast Beast Within and Reality Shift before casting Seasons Past again. An alternative route to this loop is to use Praetor's Grasp to remove all of your opponent’s libraries then use one of the many ‘all players draw’ cards to force a game over by having them draw cards with no cards in their libraries. Praetor's Grasp can be substituted for both Beast Within and Reality shift in this combo with some up and down sides. The upside is that you can cast all spells from your opponent. The downside is that it does not affect their current board state. The main problem with this would be if someone managed to gain hexproof and you do not have an ability to remove it. The downside to only running Praetor's Grasp is that both Reality Shift and Beast Within are very potent board interaction spells whereas Praetor's Grasp has no direct board impact. Praetor's Grasp is the weakest of the three in regards to tempo but can potentially be the strongest of the three. Some decks can be entirely shut down by a Praetor's Grasp. Many Doomsday decks rely entirely on Laboratory Maniac for a win. Removing it facedown makes that win impossible. Similarly a Gitrog Monster deck relies heavily on Dakmor Salvage . Exiling it face down can neuter the deck permanently. A fast meta would necessitate skipping Praetor's Grasp and a slower meta could easily include all three options. When fighting an extended control game it is a necessity to spend your life as a resource. Aetherflux Reservoir was included in Tasigur as a means to address the amount of life that is lost throughout a normal game. Very regularly we are paying over twenty life in the course of a game and it puts a notable amount of pressure on us to try to stay alive. Aetherflux Reservoir can gain back that life passively after the initial mana investment. However it can push us over fifty hitpoints fairly easily and then can turn into a win condition on its own. With many of our infinite mana packages we have an unbounded amount of storm and can gain unlimited life to feed the Reservoir and kill our opponents. The upside of this card is faced by a rather big downside, early game this card is a very bad card to see in your hand. It does not directly interact with the stack and is a bad top deck. People have started to consider Twilight Prophet as a another method of passive life gain. It is a similar option but does not fulfill the same end game potential and part of the similar early game down side - a four cmc 2/4 is very low impact without having the city's blessing. Seasons Past serves two roles in this deck. The original purpose for it was endless card advantage through self recursion. However, after a few games it was found that once we are no longer constrained by mana, Seasons Past will get us our entire deck into our hand, allowing us to cast any spell we wish to. This is accomplished by either tutoring for Seasons Past or using Seasons Past to get a tutor from our graveyard. We then tutor for another tutor, tutor for Seasons Past and get both tutors back. From there we tutor for any card, tutor for Seasons Past , cast Seasons Past getting both tutors back and can repeat this process as much as we want. We can then win through either Aetherflux Reservoir or the Beast Within + Reality Shift loop. These fulfill the same role as Seasons Past but have the requirement that we have unlimite draw. If you are running a Dramatic Scepter package, Sensei's Divining Top and the Dramatic combo can give you unlimited draw. Additionally any infinite mana combo can give you essentially infinite draw with Tasigur. This is an additional method of completing the same loops with minimal opportunity cost to include the required cards. This may be taken lightly, but this deck has both combat damage and general damage as consistent win conditions. It breaks apart other player’s plans and gives us the time required to secure a win through combat damage. Tasigur can come down as early as turn two if needed. Choosing one player (preferably one that is running Ad Nauseam ) and consistently pressuring them is the best course of action. Very rarely do we switch targets until that player is gone or the game is over. Through either Reanimation, Eldritch Evolution or Show and Tell, cheating things into play gets us a massive tempo advantage. As discussed in the Deck Packages section, many options are available to generate continual card advantage, control the board, or to help assemble an infinite mana engine. While these routes vary on their consistency levels they all focus on getting a high CMC creature into play. This is one of the least played but most powerful cards in Competitive EDH primarily due to its strategy and price tag. Below is a flowchart that walks through the functional interaction and game state checks completed by Chains, as the oracle text is very wordy. The big thing that this card does is prevent everyone from drawing additional cards. This allows us to abuse both Life from the Loam and Tasigur to get asymmetrical card advantage against our opponents. Our goal is attrition, preventing multiple people from drawing additional cards pushes the attrition strategy very effectively. To add to this, if we do have some extra card draw, we can use it to continually dredge cards. 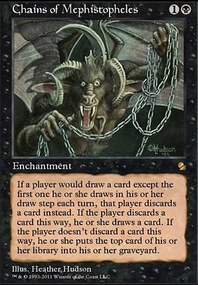 The interaction between Sylvan Library , Chains of Mephistopheles , and Life from the Loam works as follows, assuming that you choose to dredge both cards from Sylvan Library and that you have Life from the Loam in hand. If you have it in your graveyard, you can complete the exact same steps by simply dredging your first card drawn for the turn. This will then have you draw the first card from Sylvan Library as it will be the first card drawn during your turn in your draw step. Card drawn for turn, untouched by Chains. Choose to activate Sylvan Library. Discard Life from the Loam to Chains. Choose to Dredge Life from the Loam instead of drawing a card. Choose to Dredge Life from the Loam instead of drawing a card. 5.You have now drawn 1 card for the turn. Choose to put it back on top of your library or pay 4 life to keep it. Part of Chain's high price tag also brings a discussion about alternatives for those who cannot afford it. Leovold, Emissary of Trest did this job very well but has since been banned. The only alternative that is close is Notion Thief . Unfortunately Notion Thief ends up being a liability against Thrasios decks. A Thrasios deck can combo off and can then use your own Notion Thief to kill you. This leads to the conclusion that if you do not have a Chains, there really isn’t a viable alternative to it. Use the card slot to strengthen another aspect of the deck. An interesting recent addition to the deck. In Competitive EDH there is a major push to lower your mana curve. This puts a very high density of spells at 1-2 mana. This density of spells allows for a large number of blind flips for free counters on spells. If you can land this and a Sensei's Divining Top you can gain an incredible amount of advantage in both preventing cards from being played and from countering things for little to no ongoing card advantage. A key interaction of note, revealing the card is a may ability. If you know what the cost of the card is you can choose to not reveal the card. This may make your opponents think that the way is clear after casting a test spell. You can then reveal the card later to surprise them with a counter they may not have been expecting. This card is very strong in control mirrors. Specifically of note, using Gilded Drake against a commander that you do not want in play allows you to keep the commander out of its owner’s control and not recastable. Additionally if Gilded Drake ’s ability does trigger but does not change control, then Gilded Drake will die. The main goal of this card is denial of a specific value creature or of a general. For slowing down the game and stopping the combo decks, exiling key combo pieces will make things easier for you but will also pull the ire of the owners of those cards. Some decks will mostly fold when exiling a single card, like pulling Dakmor Salvage from The Gitrog Monster , card:The Chainveil from Teferi, Temporal Archmage , Necrotic Ooze from any Nooze decks, Food Chain from any Food Chain decks or Isochron Scepter from Dramatic Reversal decks. Additionally, if you feel that you do not have control of the table and cannot spend the card on exiling a combo piece, then finding a piece of key interaction, mana acceleration or card draw is very useful with this card. Knowing the general makeup of your opponent’s decks really helps with this one. This mostly works as a Negate but can also have additional uses, it can be a Strip Mine , a Stifle , or multiple if several people are ‘fetching in response’ to other player’s actions. This card has one of the highest blowout potentials of anything you can do at instant speed. I have never been unhappy casting this spell. The majority of the time when people are searching a library they have already expended resources. This can cause additional resource loss as well as just replacing itself. As this deck is not primarily a storm deck, Yawgmoth's Will usually plays a value role. It is used to recover permanents that are in your graveyard and get a tempo advantage. View this more as a late game draw five cards rather than an ‘I win the game’ card. There are cases with Aetherflux Reservoir where this will turn into a storm card but this is the exception not the rule. Falling behind in a game can happen in many different ways, some hurt us notably more than others. The one that hurts us the most is being behind on mana. If you fall behind, prioritize getting mana over card draw. With mana you can get Tasigur out and start both pressuring opponents' life totals and getting card advantage. Once you get to having six or more mana available each turn you have hit the sweet spot where you can both hold up interaction and a Tasigur activation. If you can stay in that spot for a while you are pretty close to stabilization and getting back to a controlling role in the game. When we get ahead early, what do we do? Push the mana advantage and push for card attrition. Our endgame is to start looping with infinite mana. Getting to that position earlier makes it easier to win. Additionally our opponents are going to want to exhaust our resources so that they can either take us down or combo off. Having enough mana to keep the board under control is huge. We still need to pick and choose which things we interact with, just because we got an early lead doesn’t mean that we don’t have to worry about multiple people comboing off in a single turn cycle. Unlike most Competitive EDH decks, the combo turn doesn’t really happen all that quickly. It is something that is built up over the course of several turns that then hits a critical mass and wins. There are some special pieces of interaction you will want to wary and play around. Your vulnerable moments with Palinchron are with the initial untap trigger and when Phantasmal Image on the stack. Being prepared for an exile effect at those times is key. You will want to either wait till opponents are tapped out or you have 1-2 counterspells available to respond and protect your combo. Outside of the major deck packages, there are a few options available for consideration. These may be more relevant in slower metas or less powerful metas. Temporal Manipulation and Capture of Jingzhou being the best as they do not target and cannot be Misdirection 'd away from you. These can combo with Seasons Past and a tutor to get infinite turns on a much lower mana requirement that doing a normal infinite loop. Demonic Tutor + Temporal Manipulation + Seasons Past ends up at for infinite turns. This is a viable strategy but is weak in a meta where Mana Drain sees regular play and where you do not have a consistent board state. In most competitive metas, these spells turn into Explore s. I have not included them in my own list as they would be more of a liability than an asset. Most planeswalkers have been considered a subpar strategy for Competitive EDH. With very few exceptions they are not included. In a slow, stax based meta game, a Karn Liberated , Ugin, the Spirit Dragon , Liliana of the Veil , or Jace, the Mind Sculptor could be put to use very effectively. If you can protect it, any of these planeswalkers can win the game and grind value every turn. At the current high end of the spectrum, they are not strong enough to be included. Specifically Dig Through Time , Treasure Cruise and Murderous Cut . There may be a space for one of these in the deck but it is close. Too many of these will make casting or recasting Tasigur too much of a burden and will remove too many key cards from the deck. Of those, Dig Through Time would be the highest priority to get into the deck. Ponder , Preordain , etc. When our primary goal is to recur cards with Tasigur, getting a cantrip just slows us down. One of our biggest challenges is having enough mana to interact through an entire turn cycle. Adding more mana required to get an actual piece of interaction is not desirable. Some players have included cantrips as extra cards to specifically remove when casting Tasigur. I have prefered to run a higher quantity of interaction over cantrips as the downside of adding further costs to getting interaction in your hand is a notable cost. Of note, including a Life from the Loam package allows us to run cantrips in cycling lands so that we can choose when and how we retrieve them from the graveyard rather than having an opponent choose to give them to us. Brainstorm is on its own level for cantrips and has earned its spot in most Tasigur decks. Its speed and utility is so great that very rarely will an opponent give it back to us from an Tasigur activation. It is an instant that also allows us to sculpt our hand and return cards to our libary allowing things like Eldritch Evolution to be cast after drawing our targets. As we rely heavily on reusing spells, when a key spell is exiled, the only answer is in Blue, Green or Black is Riftsweeper . This card is one that may see play in a graveyard hate heavy meta but should not be in a deck going into a blind meta. It is a secondary measure, not a staple and can fill a flex slot in a deck to tailor it to the local meta and your needs. While testing the deck there are several cards that are very close to being viable for the deck. Below I have listed several cards that can be close to what you want but not as functional as really needed. These cards can look great but for one reason or another have issues with their inclusion. Their downsides for consideration are listed. If they are not an issue for you or your deck has been built to cover this downside, these are potentially powerful cards to include. Delay - The main idea behind delay is that your aim is to win before the card comes off of suspend. Our primary game plan is slow and steady. We are not planning on winning before that spell comes off of suspend. This makes Delay only a repreive and not an answer to issues. Worldly Tutor - There is not enough demand on specific creatures to warrant the inclusion of this top deck tutor. Ancient Tomb - The life loss of this card is going to be an issue. If you can work around it, it is a power inclusion. Cavern of Souls - While this can assist with control match ups, the lack of colored mana is the deal breaker here. If you are consistently in counter wars over your creatures, it could see play but politics may be a better resolution to it than compromising your mana base. Dryad Arbor - While this can make for a powerful turn one Green Sun's Zenith, the fact that it dies to board wipes and is slow to tap for mana makes this land a no go. Forbidden Orchard - While colored mana is our bread and butter, supplying creatures to other players is really painful when we are wanting to use Tasigur as a potential win condition. Additionally Tymna's popularity make those token creatures more valuable to our opponents. The upside just isn't outweighed by the advantage that you are giving to your opponents with this land. Tarnished Citadel - The life loss is too great to consider this a valid choice for a land. Colorless lands - There needs to be a massive upside to include the land. Glacial Chasm is an example of a colorless land that has such a huge upside, that it is worth running, as it can blank an entire strategy. If you are running Life from the Loam, this land can be continually replayed and prevent all damage dealt to you. It needs to be at this level of utility to warrant consideration for inclusion. Colored mana really is that important. Chrome Mox - losing a non-land card is just too much. If you are on a budget this is a concession that can be made but in the long run, you want to avoid this card. Mind Stone and other colorless mana rocks that are not mana postive - You need to have a strong reason for having colorless mana rocks in the deck. It is a very corner case for having them and they need to have a very high upside. Thought Vessel is the only one I have personally included and it is very close to being cut. The Spellbook effect added onto it is incredibly powerful for the times when we are ahead and is the only reason it has been kept in the deck. Boreal Druid and other colorless mana dorks - We really need colored mana. Colorless mana rocks have a high onus on them, colorless mana dorks have even a higher onus. They are slower and less useful. Green Sun's Zenith - Tasigur is not typically a toolbox creature deck. Being forced to only get Green creatures limits the use of this to mostly non-interactive creatures. While this can be powerful, it is not the primary aim for the deck and should be avoided. If you were running a more hatebears styled deck and have more toolbox creatures in green this can be an inclussion but it is a commitment. Hymn to Tourach - Random discard is powerful, however this does not quite deal enough damage. It only hits a single player and only for two cards. Its bigger brother, Mind Twist , is stronger but costs more. It can see play in combo oriented tables. Merchant Scroll - While a tutor, this one just doesn't get enough for us. Its too much of a mana investment for too little of a return. There are better options to look at first such as Transmute options or other to-hand tutors. Time Spiral - Too much mana, and it exiles itself it makes it a one time use spell and just has too much investment into it. This is the biggest area that lower power metas fill up. Adding more board clears and mass removal is your primary option here. However you will want to include cards that do not kill Tasigur as much as possible. Your go to cards are below. Languish - Keeps Tasigur around and clears the board of most creatures. Black Sun's Zenith - Can clear larger creatures, like Elesh Norn, but will also kill Tasigur or make him notably weaker. Yahenni's Expertise - Clears most relevant things at a table. Can also get extra value and make up for the higher CMC in the process. Golden Demise - a one sided clear (with the city's blessing) that can kill most hatebears and mana dorks. Damnation - Nuke it and start over. Tasigur doesn't get to stick around. Pernicious Deed - Nuke everything that is at the Deed or less. It can keep Tasigur around but it also hits most of our mana acceleration. For some decks this is a death sentence and for others it is just a minor frustration. It has its place but not everywhere. Smallpox - Helps on all fronts, slow the board down, remove some creatures and get rid of some cards. It also hurts you and you have to be able to recover. Having Life from the Loam online will help with recovering for yourself. Massacre - If there is a plains out there and you have a swamp, its free. It just doesn't kill enough all the time. Glacial Chasm - Combining this with Life from the Loam is a never ending denial to aggro decks. You have a few routes to go for this but mostly you are looking at either adding more Counter Spells, Hand Distruption, or Stax pieces. One note of caution with Stax elements, you should always reconsider previous deck building choices when determining which stax pieces to put in a deck. You will want to make sure that your choices are able to play around the stax elements that you are including in your deck. For Counter Magic I will direct you to the Lexicon of cEDH Counterspells by LabManiac_Sigi. Duress / Inquisition of Kozilek / Thoughtseize - These one shot spells have the ability to remove tutored cards from opponent's hands. They all have the ability of also giving you information regarding what one opponent can do in the next few turns. These are a temporary measure but can give you the time you need to stabilize. Mind Twist - This targeted spell can destroy a combo player. Random discards and the late game ability to destroy their entire hand makes this a very potent spell. Raven's Crime - For the long term grind out games, pairing this with Life from the Loam can mean that you have enough lands to strip all your opponent's hands clean of cards. It is slower and your opponents have a choice as to what they discard, they can keep key pieces in hand. In a slower meta, this can also help reduce the options your opponents have and limit them to cast spells on their turn only. Windfall - Often considered a draw spell, this can also be considered hand disruption. Tutors end up not being as useful if the card is then discarded immediately. Trinisphere - the great equalizer. This makes everything cost at least three mana. This really helps with slowing down the super fast decks but it needs to be in play early to have its biggest impact. Sphere of Resistance and other such effects slow down the field by taxing everything. Again this can slow down the table, but most storm decks are running Helm of Awakening type effects and this tax can be nullified. Worse if they run asymetrical effects like Baral, Chief of Compliance which will make their plan cost their normal costs while your interaction will be more. Cursed Totem - Be careful here, this stops Tasigur from working. It can be incredibly powerful if you have sufficient redundant outlets but removing your Commander from major play is a dangerous course. Be very cautious when placing this card in your deck. Null Rod - The other great equalizer. Having a diverse mana base can help you play through this. This can help you fight non-green decks' mana acceleration directly. Again be careful when putting this in your deck that you do not lock yourself out of your own win. When fighting stax decks, you will want to make sure that you are not vulnerable to all the stax pieces out there, having a few basic lands and a diversified mana acceleration suite will greatly help your natural resilience to stax decks. Additionally adding in more artifact, enchantment and creature removal will help. Of note, most stax strategies prevalent in cEDH are hatebears style decks. Using some of the additional board control options listed in the Anti Aggro section will be appropriate the majority of the time. Seeds of Innocence - Mass artifact removal. Back to Nature - Mass enchantment removal. When fighting other control decks there will always be some jockeying for position. If you are ahead of the other control decks, you will want to either sandbag additional counter magic to protect your advantage or some basic protection for your board state. The downside with this is that most cards in this category are mono purpose. They will not assist you in controlling the board. As such you will have very few options that can both protect your board state OR assist with control when needed. What you are looking for are card that are low in cost and high in versatility. The type of spells that fit into this most directly are bounce spells and modular spells. A few options are listed below. Capsize - One of the more useful spells available though you are paying the price in mana. It can be used as a win condition with infinite mana but can also protect your permanents from removal. Simic Charm - One of the most versatile of spells, it can protect Tasigur from a Toxic Deluge, can give your permanents Hexproof and can interact with an opponent's game plan by bouncing creatures. Far / Away - Multipurpose and multi-targeting all at instant speed. The five total cost for a fused spell is tough but it is still a potent card. Into the Roil - Bounce and draw when you have the spare mana? Who can complain? Repeal - Bounce and draw but potentially not always usable. This is very useful when targeting the legal moxen in the format as they will help you with card davantage and require further commitment to them by your opponent. Snap - Bounce and it is free after it resolves. Not as versatile but the cost can't be over looked. Unsubstantiate - While this can interact with spells, it is only a temporary solution. Tasigur control runs into his biggest issues with Combo. Specifically if he is the only control deck at the table with three other combo decks. In a mixed environment Tasigur will do better and have an easier time. If the combo decks are playing highly interactive lists then it can be a more even game, but multiple all in combo decks will cause Tasigur headaches. The key against combo decks is early mana and making the rest of the table aware of the combo threat. If we can successfully make each turn for the combo player shift from a 1v1v1v1 setting to a 1v3 setting, then we are doing well and should be able to pull through. Against control Tasigur does very well. Tasigur has tools to exhaust opponent’s resources and is one of the strongest attrition engines for a control matchups. You are looking to push a mana advantage against other control decks. Usually we are buds with other control decks. Both of our plans involve slowing the game down. The caution here is to not get too complacent. Most other control decks are running a combo win condition. If we don’t push them to expend enough resources, we could be out controlled when they try to land their win condition. There are very few Stax elements that Tasigur control has issues with. The biggest ones to be wary of are Blood Moon, Rest in Peace and Leyline of the Void. Blood Moon is one of the strongest pieces of mana denial that can be used against us and means that you need to be wary of red decks. Fetching for basics proactively is something you will want to do against most red decks. For Leyline and Rest in Peace, you will want to conserve resources as much as possible and focus on removing these from play. With both of these you can use combo pieces such as Beast Within to destroy them. Due to timing, these combo pieces will not be exiled. Stompy decks are not a normal occurrence in competitive EDH. As such, this deck is not designed to deal with them. Tasigur will have problems when going against stompy decks on a regular basis. Adding in additional pieces of board clears, sacrifice effects and other pieces of removal can help with this. This puts Tasigur in a unique position. As a majority of non-competitive EDH decks fall into a somewhat stompy shell, Tasigur can reasonably be played in a non competitive environment while still giving the non-competitive decks a decent chance at victory. Tasigur actively pays a good amount of life away as a resource and has forgone major board control for stack control and spot removal. For an opening hand, you want to see two to three mana sources, one to two pieces of card draw and the rest as interaction that can be used with the mana in hand. This would be an ideal hand for sitting down at a table with people you have never played with before. If you are unable to get this, then prioritize mana and interaction over card draw. Be wary of a three or more lands in your opening hand if you are in a fast meta. These tend to lack the density of interaction to stay relevant in a fast metagame. This deck sometimes will give you an all mana hand. If this is fast mana that you can deploy in a turn or two it can be worth keeping. This can allow for a super fast Tasigur followed by grinding Tasigur value very early in the game. This is somewhat of a meat and bones topic for a primer. It involves a large amount of threat assessment, table feel and knowledge of your deck and what possible decks your opponents will have. As you gain more information regarding what you are playing against you should be able to piece together a general idea of what strategy your opponents are pushing. Are they a combo deck? What sort of combo? Aetherflux Reservoir ? Laboratory Maniac ? Necrotic Ooze ? All of these decks interact with other decks differently and you have to be aware of how they execute their game plan. Choosing what to interact with and when to pull the trigger on a piece of removal or counter magic is crucially important to learning how to play a control deck. One thing that sets this style of play apart from Stax style control decks is that we do not actively prevent people from casting spells on a regular basis. We let the vast majority of spells go through or leave them to be dealt with by our other opponents. We pick and choose exactly what we interact with so as to keep everyone at bay. It is a tenuous balance and takes consistent reevaluation at almost every turn. To assist with this I personally work through a series of questions while analysing how I want to interact with a spell that is being cast. This is the first question to ask. They are trying to win and everything they do will be pushing towards that game plan. The first thing to consider is how does this affect you and your board state. Is it a mana rock? That really doesn’t affect you or your resources, you don’t care about it from a territorial perspective. If it does affect our resources we need to carefully weigh whether the loss of resources is worth the expenditure. Sometimes our loss is far less than another’s and we are willing to take the hit in order to take another player down a rung. In other situations it is our board that is being hit the hardest and we need to protect our lead. There is a careful balance, the big thing of note is that we have to build our advantage slowly. Other decks are able to deploy their wins at the drop of a hat and we need to be very cautious about spending too many resources protecting things that in the end will not win us the game. Is this a Threat? Does this affect my victory or my resources? The big thing to think of here is, does this actively prevent us from winning the game or executing our game plan. The big things, for us and Tasigur's game plan, are persistent graveyard hate, persistent mana denial, or overwhelming card disadvantage - an opponent drawing too many cards or us losing too many cards. Unless it will immediately fizzle a combo player, we rarely interact with a tutor as it is not the spell that is affecting us, it is resources that our opponents are spending that we do not need to interact with. Does this threat need to be dealt with? When we have identified that a spell or permanent is a threat we then need to identify if it needs to be dealt with or lived with. Several threats we can ignore as they either do not affect us as much as other players at the table. We need to identify who all is affected by the current threat. Is it just us? Are others more or less affected by the current threat? If we feel that it is hurting other more than us, can we live with it? There are very few pieces of hate that we actively need to answer, so usually we like stax elements on the table. If we have determined that we need to deal with something we then have to figure out who needs to deal with it and when. Who deals with this threat? If it has to be answered on the stack, what is the priority order? Are we before or after the other blue players in the priority order? If there is no other Blue player behind you, most likely you will need to answer this on the stack. If there are other blue players behind you, will they see this as a big enough threat to deal with it? Do they have the resources to deal with it? Have they used any interaction recently? How much mana do they have? If they haven’t interacted much and have open mana, passing priority to them may force them to deal with this threat for you. It’s free resources to you. However, a Tasigur activation to get some interaction may be in order first. Even if you don’t have mana to use it after activating Tasigur. Do I need to Deal with this? This is a very situational decision. Your main goal is to fizzle combo players, to keep stax elements at just barely bearable for you but unbearable for everyone else, and to have card and or mana advantage on other control decks. You also want to wait as long as possible to expend resources. If the threat is encroaching on those goals, it is getting on the priority list for things to deal with. Do I deal with it Now or Later? Does this threat need to be answered on the Stack or on the Battlefield? If on the battlefield, do we care if it sits around for a while? Is this the right opportunity? This is looking at the table position. Is this spell going to win the game for a player, but if I counter it, will just let another player win before I untap? Can we look at an alternative way to interact here? Is this player the one right before your turn? Be aware of what the table situation is and make other aware of it too. The longer the stalemate goes the better off we are. The stalemates give us more time to accumulate resources and more time for our value engines to run. If it isn’t a stab at breaking the stalemate we probably should let it be. We have multitude of ways to deal with things. Counterspells, Targeted Removal, Mass Removal, Player Removal, and Creature Beats. We want to reserve Counterspells for the game winning threats - those that we cannot let resolve. Targeted Removal we prioritize on high value creatures and stax elements. Mass removal we have to use sparingly. As we are trying to lengthen the game, we end up with a rather large board presence compared to most other competitive decks. Player Removal is not to be scoffed at. Choosing who to attack with Tasigur and sticking to a single target until they are gone is surprisingly effective. Applying pressure on their life totals reduces the effectiveness of Necropotence, Sylvan Library, and Ad Nauseam. Additionally, Tasigur is much larger than most creatures that see play in Competitive EDH, this leads to chump blocks and free creature removal. 2/13 - added several decklists to the decklist section, added notes to the dech tech video about its current inaccuracies. 2/17 - Updates and restructuring of several sections. Created Deck Strategy section with list of multiplr packages that can be part of a deck. Proof reading thanks to Sigi and Dan. Razaketh section was written by cEDH_Stu and editing by myself. You can find several games of this being played over at the Laboratory Maniacs youtube channel. Additionally you can find a few videos of Buildingadeck’s budget version of Tasigur Control on his youtube channel. Here we have a community where we can talk about all levels of Tasigur Control, piloting, building, and optimizing of individual's decks. It is welcome to anyone to join and ask questions. If I'm not around many others with experience in Tasigur join in and assist. A very well put together list of counterspells. Playing to win - an amazing game theory article, worth the time to read. Playing Commander to win - a spin on the previous article aimed at commander. The Stax Primer - Knowing what you are up against is half the battle. Being prepared for tough game plans can improve your threat assessment ten fold. The EDH Doomsday Primer - Doomsday is a thing, either you run it or are running against it. Knowing how to interact and pilot it key to navigating a win around or through it. The cEDH Removal Repository - List of most cards that are powerful and cheap enough to see play in cEDH. Know what you can run and what can be run against you. While it is an awesome plan, it has not been as consistent as I have wanted it to. Betrayal and Seeds of Innocence are now sidelined and in their place we have some efficient card draw. Dark Confidant and Runic Aramasaur slide into the vacant spots nicely.